One of the joys of living in Angus is my proximity to the only commercial producer of sea kale in Great Britain. As the name suggests it grows well in coastal regions; it is perennial so if you happen to come across some guard your secret and enjoy annual feasts. Sandy and Heather Pattullo farm at Eassie (near the Glamis Estate) in Angus where they grow sea kale in long tunnels. The crowns are forced from December onwards and produce succulent ivory coloured shoots, which are similar in shape to celery with a small green leaf. It is harvested from mid January until the end of March. 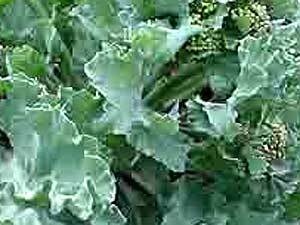 Sea kale is sometimes called winter asparagus and for culinary purposes can be treated as such. Trim well for it is cut to the main root to hold the shoots together. Wash well and steam or lightly boil. Place the shallots into a pan with the vinegar and 3 tbsps water. Bring to the boil and reduce the liquid to about 2 tablespoons. Reduce the heat and gradually whisk in the butter, one piece at a time until the sauce is smooth, thick and glossy. Steam the seakale (or cook in an asparagus kettle) for 3 - 4 minutes. This article was written by Fiona Bird who lives in Kirrimuir, Scotland. Fiona was the winner of Scottish Masterchef and a finalist in the overall UK Masterchef. Stirrin'Stuff is a campaign (based in Scotland but working across the UK) to encourage children in the practical skills of preparing food - aiming for enquiring minds, active skills, discriminating tongues, family bonding and healthy diets. Fi Bird is a mother of six and a past Masterchef finalist who has always had a passion for cooking. She is self taught with an approach to food based on knowledge of tight budgets and limited time. When, time permits she will complete an MSc in food policy. A member of the Guild of Food Writers, Fi has written extensively - articles, recipes and as a campaigner both for healthier diets and for cookery teaching at Primary schools. Fi and Dr Stephen Bird are the founders of Stirrin'Stuff which works in partnerships, to educate children about food. Stirrin'Stuff is committed to sustainable development and ethical best practice. Fi develops recipes for Tern television and writes for Country Kitchen Magazine, Green Parent, Organiclife and an occasional parenting column in the Scotsman. Fi and her daughter, Lili Bird have a fortnightly mother and daughter food column, in the Aberdeen Press and Journal. Dr Bird has recently completed a course in human nutrition and Fi, a children's cookery book, to be published by Barefoot Books in September 2008.